20/2/10 – Heritage–Haiti, Port-au-Prince – Adrien Goetz on his Facebook page had been the first to show concern, after the catastrophic earthquake in Haiti last 12 January, for the fate of the large painting by Guillaume Guillon-Lethière The Oath of Our Ancestors, veritable “symbol of liberty of the Haitian people”. We have often expressed here, and repeat, the thought that heritage, an integral element of a country’s essence, should not be forgotten in times of natural disaster. Guillon-Lethière was born in Guadeloupe, the son of a colonist and a female slave. 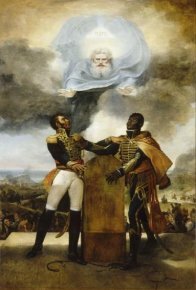 Painted in 1822, the work is a manifesto against slavery and for Haitian independence proclaimed in 1804 by General Jean-Jacques Dessalines before he crowned himself emperor. It is a symbolic representations of the oath exchanged by Alexandre Pétion, chief of the mulattos in Saint-Domingue, and Dessalines, both swearing to drive out the French troops . The painting was found in the cathedral of Port-au-Prince in 1991 (though obviously not a religious scene despite the presence of God the Father) and had been restored by the Service de restauration des musées de France in 1998, then exhibited at the Louvre, at the entrance to the exhibition halls under the pyramid, before returning to Haiti. It hung in the Presidential Palace, largely destroyed during the earthquake (as was the cathedral). According to AFP, French firefighters found the painting among the ruins who stated, still according to our sources, that the canvas stretcher (a modern one) had been destroyed and the canvas itself torn but could be restored. Although the work will be in the hands of the Centre de recherché et de restauration des musées de France (C2RMF), it will however be carried out on location in Port-au-Prince. See the presentation of the painting on this website.